Bus from Johor Bahru to Melaka is one of the most frequent routes in Larkin Bus Terminal Johor Bahru due to strong commuters’ traffic between the two cities. Thousands of commuters travel daily between the two cities. Because there is no train station near Melaka city, traveling by bus from Johor to Melaka is the only option. The duration for bus from Johor Bahru to Melaka usually takes about 3 hours. The earliest departure from Larkin Bus Terminal is at 7:30am while the last departure for the day is at 9:00pm. Most coaches will go directly to Melaka without stopping at highway resting areas, unless a washroom break is requested. The standard bus fare for a bus from Johor Bahru to Melaka is about RM 15.00 – RM 21.00. Both Mayang Sari Express and S&S International Express also offer a child fare at RM 15.70. During festive seasons like Chinese New Year or Hari Raya, bus fares may go up slightly. All coaches from Johor Bahru to Melaka terminate at Melaka Sentral, the first fully air-conditioned bus terminal in Malaysia. Melaka city is just 10 minutes driving distance away from Melaka Sentral. Taxi is available for visitors at around RM 20 – RM25. There are many bus operators providing the bus from Johor Bahru to Melaka, since the route is one of the most frequent routes as mentioned earlier. Some passengers may be confused by the many available choices. Based on observations, most locals prefer the brands of KKKL and Delima Express. The reason is that these coaches are punctual, clean and comfortable. Even though there are many schedules from various coach operators providing services from Johor Bahru to Melaka, one should not always think to purchase tickets at the last minute at a ticketing counter. Johor Bahru to Melaka bus ticket might become sold out, especially for buses from the few famous brands mentioned above. 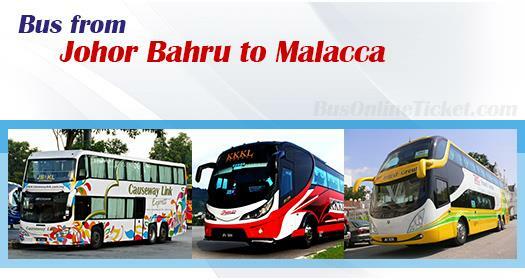 To avoid lengthy waiting time at Larkin Terminal, one can simply book Johor Bahru to Melaka bus ticket online in advance at BusOnlineTicket.com. Your booking is instantly confirmed and your seat is secured.